What can you do with a power outlet? Does your outlet do what you need? How do I install an outlet? 1. Do you have an outlet? 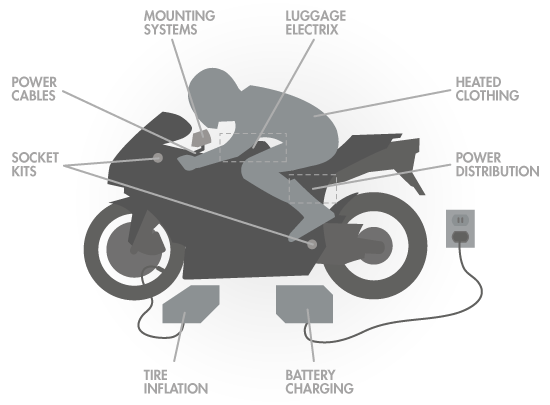 Six of the eleven major manufacturers use a 'Compatible With Powerlet' outlet as shown in the picture above on the 2012 Ducati Multistrada 1200. 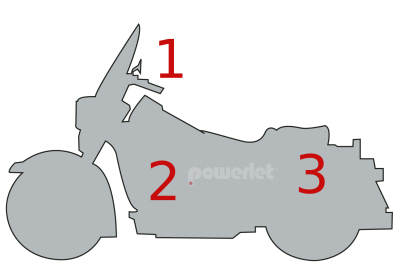 Below are the four common power outlets found on powersports vehicles. Your vehicle may already have one of these installed. While we sell all four types of outlets, we recommend the Powerlet type outlets. Powerlet sockets are smaller than a cigarette socket, vibration proof, and can handle high current loads. Six of the eleven major vehicle manufacturers use 'Compatible With Powerlet' connectors instead of cigarette sockets. The Powerlet Equipped System is designed around this connector. The Powerlet connector is also a nonproprietary DIN/ISO open standard that is factory installed on many brands of vehicles. Coax connectors are mainly used on heated clothing. Several brands of heated clothing changed from SAE to Coax connectors starting in 2003. Coax connectors are sometimes called barrel connectors. Cigarette sockets are popular in automobiles and many cell phone, GPS, and radar detector cords come with this connector. However, they often have a loose fit, are susceptible to vibration, and are not high current. Due to these drawbacks, Powerlet recommends using them in enclosed spaces such as inside tankbags and gloveboxes. SAE connectors are used on many battery chargers and on Powerlet Luggage Electrix. 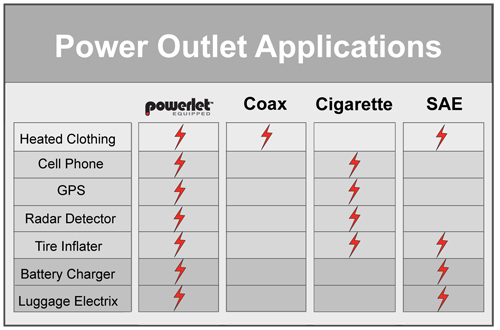 In order to use SAE connectors for electrical devices other than battery chargers, Powerlet offers a wide variety of adapter cables to convert SAE connectors to Powerlet, Coax, and Cigarette connectors. 2. What can you do with a power outlet? A power outlet can allow you to power a whole world of devices while you're on the go. Never worry about running out of batteries again! A typical inflater will take about 6 minutes to inflate a rear tire to 40psi. Naturally, better tire inflaters will take less time. Most electric tire inflaters will require at least a 10 amp fuse to handle the initial surge current (the power required to start the motor spinning). Powerlet currently offers adapter and replacement cables for converting automotive cigarette style plugs to Powerlet plugs. Powerlet will be releasing our state of the art compressor in the fall of 2008. Power out, no problem. Power in, no problem. Charge your vehicles battery with the same outlet that powers your GPS. Battery chargers typically double the useful life of AGM, wet or sealed batteries. Using a charger means a greener planet. Powerlet offers a wide variety of adapter cables that plug all of the popular chargers into any of our Powerlet socket kits. The ProForm premium line of heated jacket liners, heated gloves, controllers, and cables offers the best fit and distributed heat for all-day wearing comfort. This exciting line is backed by the best warranty in the industry. You can trust Powerlet for innovative yet practical clothing that is designed to perform for years. Why not ride in comfort? Bring power to any motorcycle tankbag, saddlebag, or tour pack with Luggage Electrix. The line includes tankbag bulkheads, internal and external cables, and cable pass-thrus. Simplify your wiring by powering many devices from inside your tankbag with our modular system. Less time wiring means more time riding! Mount any GPS, radar detector, satellite radio to music player or iPod on your powersports vehicle. We have incorporated the best that RAM and Techmount offer and assembled them as complete systems using the Powerbar Plus (patent pending) powered mounting system. Powerlet offers the largest variety of power and adapter cables for the powersports industry. Powering a cell phone, GPS, iPod, or radar detector is simple with our line of cables. Cell phones use more power trying to seek towers during travel causing the battery to die early in the day. This is not a problem when you are Powerlet Equipped. Managing the connections on your motorcycle, ATV, or powersports vehicle has never been easier. The line of power distribution products includes a variety of plugs, sockets, fuse blocks, terminal connections, tools and even starter motor wire kits for specific make and model vehicles. At Powerlet, our products are built for a lifestyle and designed to last a lifetime. Choose a Powersport Standard Connector (Powerlet Socket) or a cigarette style socket in order to power any of todays appliances. Powerlet Socket Kits eliminate dangling wires, and are available in panel mount, rearset mount or handlebar mount applications. Just like a toaster in the kitchen, plugging in a GPS, cell phone, battery charger, or heated clothing should be universal, simple and reliable. 3. Does your outlet do what you need? As the table illustrates only the Powerlet power outlet is compatible with all electrical devices. We call this the Powerlet Equipped System. One outlet does it all. Our adapters make the four connectors compatible with each other. Need to plug a cell phone into an SAE battery lead? With Powerlet products, it's easy. We engineer outlet kits for each of the four connector types. These kits are fully compatible with all brands of powersport vehicles. 4. How do I install an outlet? We have an easy wizard to help you find the right outlet kit. Just select your vehicle and we'll show you all the products that are compatible. If you already have an outlet, browse our selection of cables, accessories, and more.